Several hundred bags are still missing 11 days after a snowstorm and subsequent cold snap sparked chaos at John F. Kennedy Airport for days, according to Port Authority officials. Andrew Siff reports. Several hundred bags are still missing 11 days after a snowstorm and subsequent cold snap sparked chaos at John F. Kennedy Airport for days, according to Port Authority officials. It's a far smaller number than what News 4 sources estimated were tens of thousands of bags that got separated from their owners at the height of the airport dysfunction. But it illuminates the magnitude of the breakdown and airlines' limitations in handling baggage backups, along with a glaring lack of communication between foreign airlines, the airport's private terminal operators and the Port Authority, which oversees operations of all three New York City-area airports. Amid backlash over the JFK disaster, the Port Authority promised an investigation, to be led by former Transportation Secretary Ray LaHood. "We will leave no stone unturned," LaHood said Thursday in a news conference alongside Port Authority Executive Director Rick Cotton. The Federal Aviation Administration said Tuesday it is investigating the actions of the Port Authority of New York and New Jersey after a winter snowstorm caused major disruptions at Kennedy Airport earlier this month. Andrew Siff reports. The infamous weekend of dysfunction at JFK started when the Jan. 4 snowstorm and subsequent cold snap spiraled into frozen equipment, planes waited hours for backed-up arrival gates, and a burst water pipe flooded one terminal, causing days of delays. 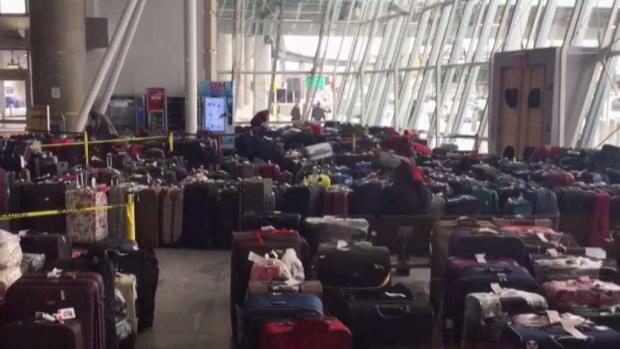 Since the disaster, News 4 has been trailing the thousands of pieces of lost luggage. Chopper 4 exclusively spotted piles of suitcases buried amid snow banks outside at JFK as desperate travelers wrote and called the station in an attempt to find their missing bags. 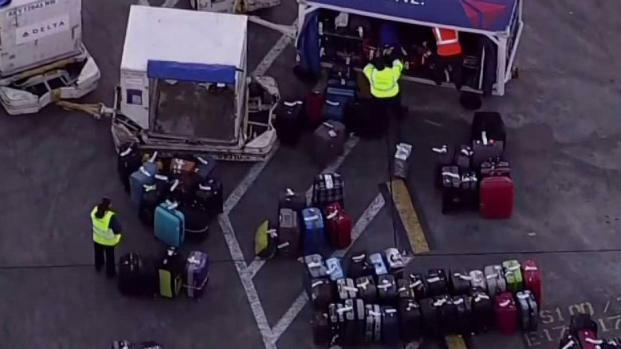 When asked by News 4 what his message is for anxious passengers who still don't have their bags, LaHood said, "I know this is a very frustrating situation. I guess my message would be that help is on the way." There has been major progress in recent days as more bags end up back where they belong, however. Dorit Heimer of the Upper West Side just got her luggage back. U.S. Sen. Charles Schumer is asking the Department of Transportation to design a plan coordinating communication among the international airlines at JFK to prevent another dysfunction in the future. Michael George reports. "Everyone told me it was lost and to make a claim," she said. "I just wanted my stuff." An airport official said Wednesday the backlog had dwindled to about 100 bags from Air China flights; the official wasn't authorized to discuss the issue publicly and spoke on condition of anonymity. A message left with the Beijing-based airline's JFK office was not immediately returned. But the official's tally apparently doesn't include bags that may have been given to delivery agencies or flown elsewhere. One luggage delivery company contracted by Delta and Norwegian to return the amassed baggage has apparently been struggling to return bags. 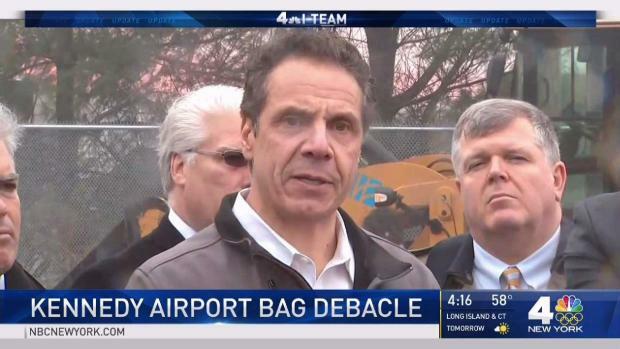 BEX is based near JFK Airport, and Billy Hassell, the auto body shop owner that leases the space to BEX, told News 4 Wednesday that in more than a decade, there's never been anything like the recent baggage tsunami. Hassell said BEX was working 24/7 and were doing their best, since in many cases, the bags had no addresses on tags. He said it's too easy for the huge airline to blame the small business tasked with delivery. "These guys were just pushing themselves to the limit as hard as he can," he said. At one point, there were so many suitcases, Hassell let BEX sort some in his garage, and even offered to take some bags to people on Long Island, where he lives. "I was just looking to help him out," he said. The industry generally has a good record on luggage: Thanks to improvements in bag-tracking technology and processes, the rate of mishandled baggage has fallen 70 percent since 2007, hitting a record low in 2016, according to airline technology firm SITA. But airlines aren't prepared for an unexpected backlog that happens fast, said Robert Mann, an industry consultant and former airline executive. "When an event like this happens, there's suddenly no physical manpower to address it," Mann said. "They are forced back into manual procedures and not equipped to handle it." Under U.S. regulations and international agreements, an international passenger whose luggage was lost may be able to recoup up to $1,536. A domestic passenger might claim up to $3,500. For baggage delays, airlines may have to pay "reasonable" expenses. 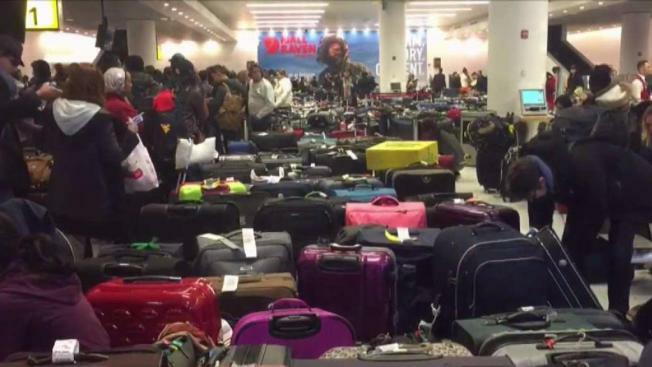 Are you in the tri-state area and still missing luggage from JFK? Please contact us at tips@nbcnewyork.com.